When it comes to casino games that combine innovation with quality gameplay, few compare to games from Yggdrasil. Now, the software provider has launched a casino games fan site that will allow you to play their games for free! The initiative will help gamblers test the casino games before playing for real money and will also drive traffic to Yggdrasil powered casinos. In other words, this will benefit gamblers and casino operators. Yggdrasil CEO Fredrik Elmqvist said: “Yggdrasil products are, and have always been, about quality and innovation and Yggdrasil Casino remains true to our values. We want to work closer than ever with our valued partners to identify the best ways to promote Yggdrasil content as well as their own content and drive even higher levels of traffic to their casinos, further boosting their revenues,” he added. 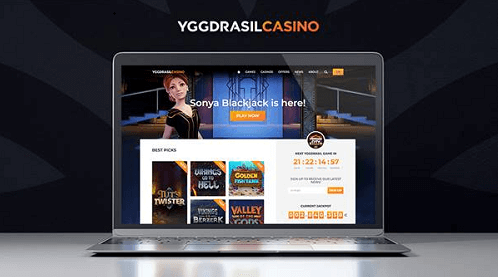 The new fan site will offer Yggdrasil’s complete gaming catalogue; including their most recent releases such as Sonya Blackjack and Tut’s Twister online pokie. While the software provider has a list of world-class online pokies, Sonya Blackjack marks their entry into the table games sector. Sonya Blackjack uses motion capture technology that gambling enthusiasts have praised as live dealer casino turned virtual casino experience. The game was first showcased at ICE and “witnessed unprecedented interest.” In fact, the gaming developer plans on ‘reinventing casino’ and Sonya Blackjack is how they have kicked off their goal. The other new game you can play is Tut’s Twister online pokie; this is an Egyptian-themed pokie that’s compatible on desktop and mobile. The casino game is fitted with wilds and winning multipliers – you definitely would want to try this pokie for real money. While this is most certainly a fantastic online gaming opportunity, we know that real fun is in playing for real money. Did you know that one of the real money online casinos featured on Pokies.com is currently running a promotion in conjunction with Yggdrasil? Check out PlayAmo’s promotions and take advantage of their promotion today!